Boutique of Quality Books, 9781939371720, 234pp. Intrigue, mystery, vivid imagery, fascinating dialogue, and complex characters quickly draw the reader into this "subtle psychological mind-bender." One insecure perfectionist. One guilt-ridden artist. One child-woman who talks to peacocks. A trio of complex heroines on separate journeys toward a single intertwined truth. Imagine living exclusively for others and waking up one day with a chance to start over. The terrifying new beginning reeks of abandonment and betrayal. The choice for Seattle resident Monica lingers between now and then... them and her. Izabel's idyllic existence on Orcas Island is turned upside down during the birth of a friend's child. Suddenly, pain rips through her own body, and life as she knows it shifts, hinting at a forgotten past and propelling her toward an uncertain future. On another island, young Daisy awakens surrounded by infinite shades of blue. Is she dreaming or has she stepped through the portal into a fantastical land where animals spout philosophy and a gruesome monster plots her destruction? Blue—a subtle psychological mind-bender where each heroine is her own worst enemy. Eccentric. Lovable. Unforgettable. 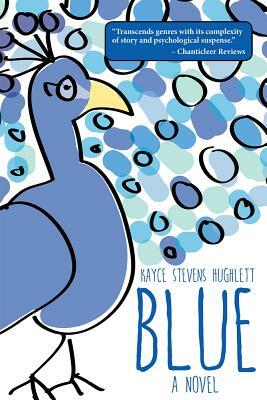 Kayce Stevens Hughlett is an author, a long-time blogger, and contributor to several collections and online publications. She is also a mother, grandmother, psychotherapist, wife, sister, orphan, friend, spiritual seeker, lover of nature, and fan of cozy beds, yellow cats, and warm fires. A grown person with the heart of a child and a self-proclaimed artist of being alive. A native of Oklahoma, she and her family relocated to the Pacific Northwest more than twenty-five years ago. Her first career was as a posh accountant in a downtown high-rise, now she's an author and speaker practicing creative life coaching around the world. Kayce's 2012 non-fiction book, "As I Lay Pondering: Daily Invitation to Live a Transformed Life," is a lyrical and lucid treasure that invites readers to new awakenings throughout the year.